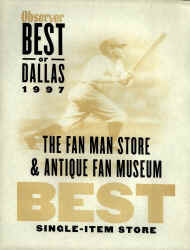 Specializing in the repair and restoration of antique fans, and the reproduction of antique fans and parts. Like a breath of fresh air, The Fan Man transports you to an earlier, simpler time. Old-time craftsmanship is the rule, and antique fans and parts are recreated exactly as they used to be, from careful study of original factory records and photographs. The Fan Man features one of the Southwest's best collections of antique fans, including ceiling, desk and oscillating fans, gyro, parlor and column fans. Prices vary from $150 for a GE "as is", to $3,500 for a fully restored ornate model Westinghouse ceiling fan with four lights and etched antique shades. Naturally, due to the limited number of the older, rarer fans (many are one-of-a-kind), they are subject to availability. In addition to the large number of antique fans for sale, The Fan Man specializes in the repair and restoration of antique fans. He also reproduces certain popular fans, like the 1920 Luminaire pedestal fan, as well as vintage Victorian and Art Deco Light Fixtures and accessories. From our new 4,000 foot facility in historic Lakewood, we now maintain over 600 unusual fans of all kinds, including spring wound fly fans, water and fuel powered fans, battery and early (ca. 1885) electric fans, solar powered, coin operated, perfume fans, ribbon and rubber blade fans, belt drive, and horizontal Palm Leaf types. Nearly everything is for sale. Open to the public, free admission. Monday-Friday 11:00 a.m. - 1:00 p.m. Send mail to ldenoyer@spectrumsquare.com with questions or comments about this web site.